Our question is, what do distinctions do in respect of the doctrine of God? Let us briefly recap. God is free, the creation is contingent – at least the Christian church has, in the main, taught. There are notable exceptions, notably Jonathan Edwards, who boldly, in the characteristically Edwardsean manner, claimed that the created universe was a free, self-determined act of God who in view of his nature, sought a theatre for the display of his glory, the full panoply of the divine nature, his love, but also his justice, the entire beautiful spectrum. But even Edwards, as I understand him, did not argue that the created universe is a part of the divine nature, a natural extension of it. So even for him there remains a distinction between God and the creation. One way that theologians – though perhaps not Edwards – have moved in characterising the distinction between God and the creation that he freely brought to pass is to say, as noted, that the creation is contingent. It is contingent in the sense that it is dependent on God – Edwards would not demur from this – but also that it is logically contingent in that the universe might not have been, or at least that this universe might not have been. Another way - currently favoured by some who reflect on these matters – is to invoke the idea of synchronic contingency, the idea, that is, that at the very moment, an eternal ‘moment’ – at which God creates the universe, he might not have created it. I argued that this idea appears to do nothing to advance our understanding of divine freedom, and it may in fact amount to nothing more than a somewhat baroque way of characterizing divine freedom in terms of logical contingency. The moral I drew from this is that those who attempt to think clearly about the divine nature and its operations, as opposed to those who are happy to articulate these matters in more rhetorical terms, need to be careful to note that a distinction that we are able to draw in thought may not correspond to a feature of the divine nature, and that we need to be aware of this fact lest we are bewitched by the illusion that we can explain more than in fact we can, and are (therefore) cleverer than in fact we are. I should like to illustrate the point further by means of another example, drawn from the doctrine of the Trinity. Christian theologians have routinely stated that the threefoldness of the Trinity, that God is Father, Son and Holy Spirit, refer to distinctions in the godhead, not to divisions in it. All divisions involve distinctions, but not vice versa. What is behind this difference? Something like this: to suppose that there were a division between say the Father and the Son, is to suppose that the terms ‘Father’ and ‘Son’ denote different parts in God. So that the divisible Godhead would be made up of three parts – Father, Son and Spirit – who together comprise it. The problem with such a proposal is that it violates another essential property of God, that he is simple, without parts. Another is that Father, Son and Spirit would each be part of God, and so not the whole God, and so not wholly divine, but divine in a much lesser sense, that each had a divine ‘flavour’. Not quite what we want. The eternal God is not to be thought of as built up out of or composed by metaphysical states that are more basic than he. So there is a threefold distinction in God, but not a three-fold or any-fold division in God. But what then, is a distinction that is not, or does not involve, a division? Here I think the theologians begin to walk something of a tightrope. Are the distinctions simply in human minds as they contemplate and reflect on the nature of the divine nature. That is, are they merely nominal, a matter of human classification, made for our own convenience? Or are they real; that is, do the distinctions correspond to something in the nature of God, and so are warranted by that? When thinking of distinctions in God are we merely saying, ‘Let us think of God in this way, as having the following distinctions’ while not insisting that the distinctions actually are distinctions in God? And the answer to this question is somewhat fence-sitting – the distinctions uphold features of the divine nature, that the Son is not the Father, nor the Father the Spirit, and so on, but the distinctions do not mark divisions. What warrants avoiding the language of division nevertheless warrants the language of distinction. And what is it that warrants this language? Why, nothing other than the Scriptural testimony, according to which, while the Father is not the Son, the Father and the Son (and the Spirit) are one God. There is something about the nature of God as revealed that prompts or warrants or corresponds to the distinctions that are drawn about him. But in the same way there is something about the nature of God that checks our application of the idea of distinctions, that does not warrant us in understanding these distinctions as divisions. What is this? Why, data about the divine unity. So those distinct persons are each God, wholly God, not each a part of God, and they are perichoretically related to each other, circumincessionally, if you prefer latinized English. (This idea too, whether from the Latin or from the Greek, is a bit of place-holder registering our incomprehsenion of the triune-divine unity.) The persons are somehow ‘in’ each other, without their loss of identity. We are familiar with this idea of a distinction which is not a division from thought about other matters. The circle has a radius, a diameter, and a circumference. These are also interrelated mathematically, as school children know. Is the radius a part of the circle? Hardly. Nevertheless, the example is not wholly clear, as the circle itself can be bisected and so on. The bird’s wing has a leading edge and a trailing edge. Are these separable features? Can we remove the leading edge? Only to replace it by another leading edge. We can divide the wing, though, take it to pieces. So these geometrical and physical examples are not entirely to the point. If we bring a magnifying glass or a microscope to the petal of a flower, we see more detail than otherwise. If the magnification is increased, so may the detail be. With the magnification, we learn more and more about the flower, its detail, and this may lead to more and more explanation, or it may confirm explanations already offered. But in the case of theology, there is no equivalent of the magnifying glass, and the nature of God cannot be explained and categorized like a flower-petal. Instead it is necessary - often prompted by erroneous teaching – for theologians to make distinctions. But it is important to note that those who use such distinctions do not know more about God than those who do not. Because the distinctions are not items of knowledge so much as directions for thought about God, and if the distinctions are good and sound then they will help the church, when under pressure, to respect the contours of the biblical revelation about God. A balancing act, you see. 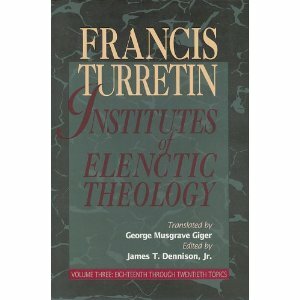 Various proposals made (Turretin discusses them all, and himself prefers the modal way of forming the distinction), and yet Turretin advises: Don’t press any of them, and don’t imagine that they help us to travel farther in our understanding than they do, which is not much. All the distinctions he cites are after the same thing. They each affirm that there are three persons, - three-personhood is not an anthropomorphism or a mere figure of speech or whatever - but they also affirm that we cannot capture that threeness-in-unity by a conceptuality ‘drawn from human and finite things’, because if we attempt that we imperil the essential unity and divinity of the three. So what all the proposals are after is the safeguarding of a certain way of thinking, distinguishing but not dividing the persons in the godhead, and provided that they secure this, they ought not to be squabbled over. So it is, I believe, in the case of divine freedom in creation. How are we to secure the recognition of this freedom? By asserting the logical contingency of the relation between God and creation. Even, if you wish, by invoking synchronic contingency. But ‘these various notions ought not to be troubled and cut to the quick’ since neither comes near to explaining divine freedom. It merely safeguards it in our thinking. No mean achievement.